I first heard Maria Schneider when she was conducting her commissioned composition at the Monterey Jazz Festival in 1995. I later attended her press conference there. "I love to be told stories, and I love to tell stories, " she told the adoring media. "And I love to engage with people. " Those sentiments, apparent in her "Scenes From Childhood' back then, are on display again in the latest release in her double-Grammy-winning career. She’s bolstered this time around by two sets of lyrics drawn from two different poets, Nebraskan Ted Kooser and Brazilian Carlos Drummond de Andrade (as translated into English by Mark Strand). 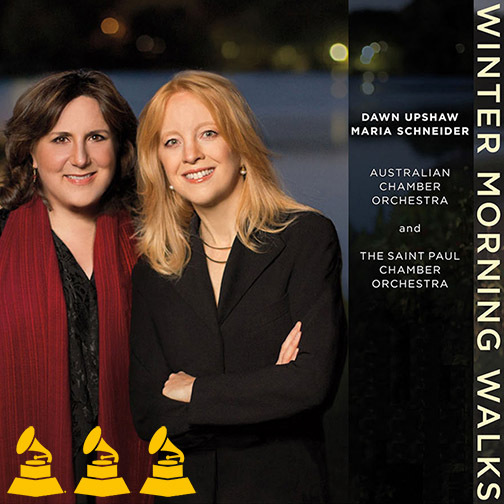 Working with lyrics is a first for Schneider, as are her collaborations here with a classical soprano, Dawn Upshaw, and with two major classical ensembles, the Australian Chamber Orchestra (for Kooser’s Winter Morning Walks) and The Saint Paul Chamber Orchestra from her native Minnesota (for Drummond’s Stories). She seems to have successfully engaged all parties involved with the realization of the album, and listeners with a love for orchestral evocation will likewise be captivated. Kooser wrote the nine poems selected for Winter Morning Walks while he was working a successful recovery from cancer. Schneider proves an artisan in marrying melody to words, as in her tonic-dominant setting of the “side to side” swing of a flashlight in the early dawn. She also masters the colors of her strings and the rhythm and pacing of her ensemble and soloists to set affecting scenes of Great Plains naturescapes and domesticity. Upshaw delivers the evocative poems in a voice as clear and bright as the described “solstice morning, in bone-cracking cold.” The soprano divests herself of the inappropriate aspects of classical training, instead bringing the composer’s music across in the contemporary, talky style of Broadway, but with a rarely heard elevation of purity and heart. This is a sterling standard for American art song. Having displayed an impressive variety of musical forms with the Kooser poems, from lushly romantic to quietly contemplative to quasi-atonal, following the poet’s different moods and subject matter, Schneider manifests a credible and affecting Latin American and Iberian tinge throughout the five tracks of the Drummond material. The Prologue, in fact, functions as a lovely homage to Heitor Villa-Lobos’ beloved Bachianas Brasileiras No. 5, entrancing vocalese included. Schneider dresses the lovelorn Don’t Kill Yourself in flamenco harmonies and buleria rhythms, while the Quadrille evokes a Piazzolla chamber setting, allowing for individual displays of string virtuosity by the Saint Paul ensemble. Upshaw’s passion and prettiness shine through all of this. In that jazz setting more than 17 years ago, Schneider had voiced her wish “to be called an American composer.” With this offering, she’s more than earned the respect and appreciation of the best who claim membership in that group.